For Assignment 4, we wanted to take STREET CLUB back to the photographer: photographing your loved ones in a street photography, dynamic, and meaningful way! Try to practice composition techniques (dynamic angles, clean background) or use eye contact, hand gestures, background context to tell a story. Reveal emotion and yourself through your interaction with your loved ones when photographing them. During the week, complete the assignment and upload your 1-3 best new photos from the week to this thread. Feel free to answer the reflection questions or add your own reflections on the assignment: What were your challenges and successes? ONE PHOTO OF YOUR LOVED ONE EVERY DAY: Photograph your loved one in the morning, while they are working, when you go to the coffee shop or dinner together. Then at the end of 1 week, choose your three best photos which tell the story of your loved one and (also share it with them). MIRRORS AND REFLECTIONS: Photograph your loved ones through mirrors or reflections. Try to do a self-portrait of yourself and your loved one. This will put your soul in the photograph and help remind you of the good times you’ve had together. Purpose: We hope that this assignment can remind you to photograph those closest and most meaningful to us (friends, family, partner, children). By directing our ‘street photography’ eye and dedication to our loved ones, we can also find more joy and appreciation in our everyday lives! How did I integrate street photography techniques when photographing my loved ones? How did I feel a deeper connection with my loved ones when I photograph them? What type of story or emotion am I trying to convey through my photo? MIRRORS AND REFLECTIONS: Photograph your loved ones through mirrors or reflections. Try to do a self-portrait of yourself and your loved one. This will put your soul in the photograph and help remind you of the good times you've had together. How did I integrate street photography techniques when photographing my loved ones? I photographed Cindy a lot ‘candidly’ — when she wasn’t really paying attention. Also integrating hand gestures, and minimalist backgrounds. How did I feel a deeper connection with my loved ones when I photograph them? I realized how beautiful Cindy was; and how I often take her for granted. What type of story or emotion am I trying to convey through my photo? I want to show elegance, love, and the joy of being alive! Hi Luis! I really like the first photo with your dog…the blurred background, the lights..maybe I would have made the dog sharper and cancelled the leaves in the left corner.. anyway, very nice composition! Hi Luis! I really like the first photo with your dog...the blurred background, the lights..maybe I would have made the dog sharper and cancelled the leaves in the left corner.. anyway, very nice composition! My favorite photo of yours is the last one.I like the “looking down point” of view and how clearly I can see the interaction between the girls.Really nice triangle composition! My favorite photo of yours is the last one.I like the "looking down point" of view and how clearly I can see the interaction between the girls.Really nice triangle composition! How did I integrate street photography techniques when photographing my loved ones? I photographed Cindy a lot 'candidly' -- when she wasn't really paying attention. Also integrating hand gestures, and minimalist backgrounds. This is a nice moment and I like the depth of the picture. I like how there are things calling for my attention in the foreground, midground, and background like the cup, your son, and your wife and the family picture. Is this the only photo from this moment? Did you take a few others? I am curious to see any variants but I like the idea of the photo a lot. The photo tells a great story. Brilliant reflections and composition. So much going on but it all fits. Agree with @astromarinaio on the placement of objects in the frame. Wonderful! Thanks all for your appreciation and feedback ! I really enjoyed taking this photograph and it is one of my personal favourites. Somehow, I always have a chuckle in my mind when I see this, especially my wife’s expression. She was like, savouring the moment, as a mother feels when the child is eating. Thanks all for your appreciation and feedback ! I really enjoyed taking this photograph and it is one of my personal favourites. Somehow, I always have a chuckle in my mind when I see this, especially my wife's expression. She was like, savouring the moment, as a mother feels when the child is eating. Great use of geometry in your mother and son photo.I like all the different shapes and the depth of field you captured.The cherry on top for me is the ‘kind of surreal appearance ‘of your wife in the back -a way smaller then the boy in the front and leaning against the vessel.Great!!! Great use of geometry in your mother and son photo.I like all the different shapes and the depth of field you captured.The cherry on top for me is the 'kind of surreal appearance 'of your wife in the back -a way smaller then the boy in the front and leaning against the vessel.Great!!! Really lovely photo Chandra; — what is the metaphor of the apple? Really lovely photo Chandra; -- what is the metaphor of the apple? This is another nice moment. I like how your daughter is closer and her mother is lit up a bit more. The lighting and shadows are fantastic. I love the way your daughter’s eyes draw us to the apple on the table. The lighting and shadows are fantastic. I love the way your daughter's eyes draw us to the apple on the table. Thanks all ! Appreciate your feedback and kind words ! Eric , the apple helped me in composing the picture so as to give a triangle. The eyes move from my daughters eyes to the apple to my wife and so on. And also it provides a slightly different colour while the eye moves. To be honest, I did not think of it in metaphorical terms…Of course, in hindsight I can now attribute something to it, which I would not want to do ! Eric , the apple helped me in composing the picture so as to give a triangle. The eyes move from my daughters eyes to the apple to my wife and so on. And also it provides a slightly different colour while the eye moves. To be honest, I did not think of it in metaphorical terms...Of course, in hindsight I can now attribute something to it, which I would not want to do ! Chandra, I cannot think of anything to add to the comments above except to tell you how much I enjoy both these photos, especially the soup scene. Like the second photo. Great light. I just miss mom’s the right hand and a gesture with the apple. Great job! Like the second photo. Great light. I just miss mom's the right hand and a gesture with the apple. Great job! My girlfriend Natasha has been working very hard for months on an animated film and I was very fortunate to catch her in action. A great series @astromarinaio. Love the angle and the expression in the first, the intimacy and tone in the second, and the placement among objects in the third. Excellent work! Animators rock! Like them all, but my favourite is the first. Its pretty intimate look into daily routine, and there is a vulnerability about someone standing there in pajamas eating yogurt. Many people wouldn’t allow themselves to be photographed that way and it reflects on her trust and relationship with you. In a way, because you chose this scene, I think this photo may be more of a reflection of who you are than the subject. I don’t know if I’m making sense. At any rate, I love the photo! I specially like the second one, the way she is laying on the bed, her hands, her way of looking to the computer. For me it is reflecting an intimate daily moment. Nice! I really like all of them, especially for the minimalism, in the subjcts and in the colors… for the same reasonI don’t like the bnw conversion for the second one,I’d rather left it in color! However, great job and nice story! I really like all of them, especially for the minimalism, in the subjcts and in the colors... for the same reasonI don't like the bnw conversion for the second one,I'd rather left it in color! However, great job and nice story! I Like all of them, I think you did a great job in capturing moments of your life together. The second is my favorite, love the tone and feels as if the viewer is right there! All of them are great captures,but the one that caught my eye is the last one.I love the simplicity of that composition! Great placement of your subject,soft light and lovely tones (especially the blue chalkboard)! Great job! My grandchildren…three out of five…my joy of life !!! Enjoyed your series and totally agree with @astromarinaio that your grandchildren are adorable. I love the joy in the first but my favorite is the second image. The personal reflection in his ‘faraway’ eyes and the lighting really bring it home for me. So much depth in that image. I wouldn’t change a thing! Enjoyed your series and totally agree with @astromarinaio that your grandchildren are adorable. I love the joy in the first but my favorite is the second image. The personal reflection in his 'faraway' eyes and the lighting really bring it home for me. So much depth in that image. I wouldn't change a thing! I agree with everything, except that I think you are the perfect distance away I. The second photo. That one is my favourite! You have captured a beautiful quiet candI’d moment. Wonderful! Love the minimalist approach in the 3rd photo and its tones.But the second of your photos is my favorite.The portrait of your grandson looks like a vintage book illustration!Great pose,expression,wonderful tones – a big Fav! Love the minimalist approach in the 3rd photo and its tones.But the second of your photos is my favorite.The portrait of your grandson looks like a vintage book illustration!Great pose,expression,wonderful tones - a big Fav! This was a difficult assignment for me. My partner and I live on a sailboat where space is at a premium. We are often together 24×7 for weeks on end in sometimes difficult circumstances without the opportunity to run out for a coffee when we urgently feel the need to get away from one another. Street Photography is how I carve out my space. It is the place where I create and it allows me to connect with others long after the image is made. 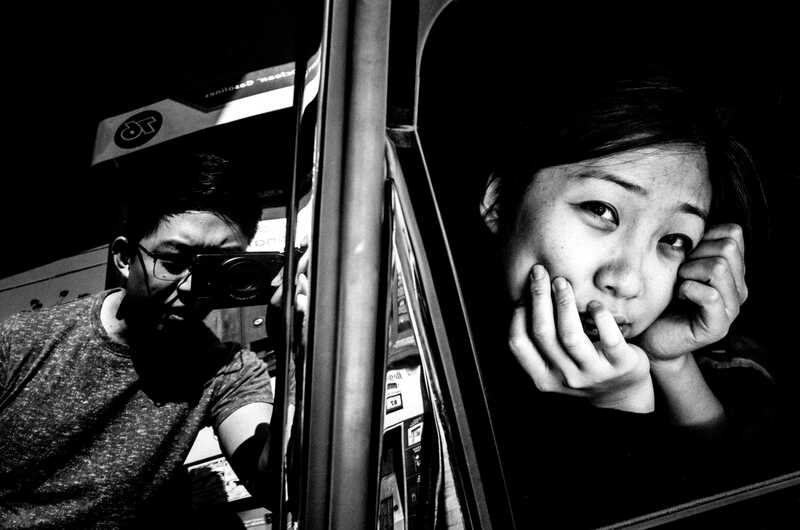 I find I photograph strangers much differently than people I know. This week’s assignment brought my partner into my precious ‘partner free’ zone and at first, I was like ‘NOOOOOO!’ But in the end, it made me begin to rethink the way I photograph him and reminded me how lucky I am to be traveling with him. He is my hero and The Captain of our grand adventure. He floats my boat. Still hoping to get a good mirror/reflection image, but thought I would post the first half of the assignment today. Hi Lisa, To me, all of your photos, including those from other assignments, are interesting and exotic. I feel like I’m visiting right there along with you. But in these three shots, it really doesn’t feel like visiting so much as actually being part of that community- there is a level of comfort between all the people in your shots. Your partner looks happy and at home. I love the third shot, particularly the eye contact of the child in front, and the wave of the little boy on the right. And the lighting is gorgeous! @Geoff Thank you so much for your lovely and insightful feedback. You’ve encouraged me to include my partner in more of my images to give a better sense of our life out here. He is one of those types that quickly establishes a rapport with most everyone he meets (speaking four languages certainly helps). I tend to be shyer and I hide behind my camera a lot here as I don’t speak the language. @Geoff Thank you so much for your lovely and insightful feedback. You've encouraged me to include my partner in more of my images to give a better sense of our life out here. He is one of those types that quickly establishes a rapport with most everyone he meets (speaking four languages certainly helps). I tend to be shyer and I hide behind my camera a lot here as I don't speak the language. @vickiseabrook He was enjoying himself indeed; biggest kid in the dinghy. Greatly appreciate your very kind feedback. I’m enjoying the street style in your other way travel photography!Very interesting,nontraditional,very well done!If I have to choose only one image ,this is the last one for its magic light! I'm enjoying the street style in your other way travel photography!Very interesting,nontraditional,very well done!If I have to choose only one image ,this is the last one for its magic light! This was a difficult assignment for me. My partner and I live on a sailboat where space is at a premium. We are often together 24x7 for weeks on end in sometimes difficult circumstances without the opportunity to run out for a coffee when we urgently feel the need to get away from one another. Photos taken from the back can often tell as much and sometimes more than a traditional portrait. I like this image because it is has a softness about it … an almost romantic feel with light coming though the leaves reflecting on his back. The bent indicate as posture indicates that he is old and getting more fragile. Photos taken from the back can often tell as much and sometimes more than a traditional portrait. I like this image because it is has a softness about it ... an almost romantic feel with light coming though the leaves reflecting on his back. The bent indicate as posture indicates that he is old and getting more fragile. I really like this photo, for me it feels like a man walking through the universe with the sun on his back, It’s kind of meditative. Really nice! I really like this photo, for me it feels like a man walking through the universe with the sun on his back, It's kind of meditative. Really nice! I adore the intimacy of the two dad photos and think you should add to the series. The first one gives a sense of a lonely, only man struggling up the stairs but the second one gives a sense of a happy man full of life who is far younger than his years. Two totally different moods and tones with the same person shot from different angles. Brilliant! @ amozeto and lisadorenfest. Thanks for your comments. I also love the photo of my dad where he is smiling …. the other one I also like cause it shows that he has been struggling with arthritis for the last couple of weeks making it painful for him to walk …. I reminds me how precious and fragile life can and that we should be grateful for every moment we have with our loved ones. @ amozeto and lisadorenfest. Thanks for your comments. I also love the photo of my dad where he is smiling .... the other one I also like cause it shows that he has been struggling with arthritis for the last couple of weeks making it painful for him to walk .... I reminds me how precious and fragile life can and that we should be grateful for every moment we have with our loved ones. I really like both these photos. The same subject, but so different. The second one makes me smile. I think, very marginally, I like the first one a little better, just because It’s a bit more complicated and mysterious. The fact he is wearing a towel implies he is still getting out there and enjoying life despite the frailty/pain in his posture. If I didn’t know the background story, it wouldn’t be so poignant for me. If you were to post this elsewhere or display it, I might title it with something like “After the Swim” or “Returning from the Sea” or something. Nice job on both photos! I like the second photo, it expresses a lot of joy and joviality!! I like the exact moment you took the photo! I really like the photo of your father going up the stairs. I like the shadow made by the tree. I only wish the photo was a little brighter, especially in the shadow area. I want to see more details of the leaves and your father’s head. The portrait is very nice too. I like his expression and softness. I really like the photo of your father going up the stairs. I like the shadow made by the tree. I only wish the photo was a little brighter, especially in the shadow area. I want to see more details of the leaves and your father's head. The portrait is very nice too. I like his expression and softness. I like them both,but the first one is so interesting with the shadows on his back and the great texture on the towel!The BW processing works great! What I especially like about this photo is the circle shapes and waves. The tattoo seems to have both as does the water and his face (made by his eyes, head, and wrinkles. I also like that he is more to the left of the frame. Very nice shot. I keep gravitating to this picture. The composition is terrific and I agree with Lisa on all her points. But the eye contact! So fantastic! It makes me feel he is looking at the viewer of the photo rather than a camera! Wow! Wonderful eye contact!I see the “waves” repetition in your image!Well spotted and captured! Wonderful eye contact!I see the "waves" repetition in your image!Well spotted and captured! My hubby, Mike, and I live on Vancouver Island, away from many wonderful relative who live on the mainland. However, we are blessed to have so many friends we count as family right here. I guess the street photographer technique would be the candidness of the shots, no posing. Although it is a little different with my friends because it’s not about being stealthy, it’s about taking so many damn photos that nobody pays attention to the camera anymore! The first shot, hubby driving a little motorboat we took out with a few friends on Friday. I’m sitting in the bow of the boat. He’s totally in his element. I’ve just asked hm something- I can’t remember what. Reflection shot. Second, Mike last night, at a friend’s barbecue with our dog, Daisy, who you all have seen before. Third, our friend Michael and his dog Sophie, at the same barbecue, just before the evening sun disappeared behind the trees. I like your third photograph, Geoff…one of the best portrait in this assignment…it´s composition in very well done…it carries mystery to the scene…the dog is, to me, the it´s high point…congrats…. the third photo is like taken from a movie, if has some magic.. I love the light in all of your images!My favorite one is the third image -The dog is so well framed against the black shirt of your friend,wonderful contrast!The dog looks straight in the camera,but its owner away -very well done dog’s portrait! I love the light in all of your images!My favorite one is the third image -The dog is so well framed against the black shirt of your friend,wonderful contrast!The dog looks straight in the camera,but its owner away -very well done dog's portrait! Hi Geoff. Good images. I especially like the two first images … nice reflection you caught in the glasses. The contrast between the smiling man and the sad looking dog in the second catches my eye and makes me smile . How lucky are you to live on Vancouver Island? All three images are great Geoff! The first is a great reflection shot with you there in the sunglasses. Mike clearly seems happy in his element. I like his face in the right of the frame slightly tilted upward. In the second photo, the BW accentuates his wrinkles beautifully. I also like that neither he nor Daisy is facing the camera. A great composition. The lighting and shadows in the last shot are very nice as is the reflective expression on Michael’s face. How lucky are you to live on Vancouver Island? All three images are great Geoff! The first is a great reflection shot with you there in the sunglasses. Mike clearly seems happy in his element. I like his face in the right of the frame slightly tilted upward. In the second photo, the BW accentuates his wrinkles beautifully. I also like that neither he nor Daisy is facing the camera. A great composition. The lighting and shadows in the last shot are very nice as is the reflective expression on Michael's face. Hi Geoff. Good images. I especially like the two first images ... nice reflection you caught in the glasses. The contrast between the smiling man and the sad looking dog in the second catches my eye and makes me smile . Like a perfect street shot … love the angle. Makes me wonder ‘what is he doing there’. Like a perfect street shot ... love the angle. Makes me wonder 'what is he doing there'. Hi Vicki! I really like the angle, also- both the perspective from above and the angle of the mattress. Feels very candid, with him resting and especially with a bit belly showing. But of course there is some nice eye contact, just like you have “caught” him. But the totally cherry on top for me is the “This side down” label. Wonderful! Very cool photo. Somewhat surreal and mysterious. Good contrast and overall composition. Cool in a cinematic kind of way. It’s like a still from a film but also like a postage stamp randomly on a table. Cool in a cinematic kind of way. It's like a still from a film but also like a postage stamp randomly on a table. Such a clever composition you created!Love it! Thank you all for the feedback! appreciate it! I like the pensive expression in the first pic, and the colours in his shirt. The lower background is white, which I like, but I wish the upper background was darker/black- I think that would really set off your boyfriend’s skin tone and shirt. Really love the 2nd pic. The beard, long hair, and the drape and folds of his blanket remind me of scenes from classical painting and sculpture. Very serious and even Christ-like. It the expression is anything but serious. I like this juxtaposition a LOT. The POV is great, the fact that half his face is in the shade, and I like dark background below and the light background above. Splendid portrait! I really like the 2nd photo. I agree with Lisa, good job with the angle.Great expression! I like the high key technique in both of your images,but the second one is my favorite.The bw processing makes the portrait look like a drawing!Great job! This week I was having family vacation and sorry,no much time for comments.But I’ll catch up with you very soon.After taking many shots of my son and husband this week,having the assignment in mind,I realized that capturing the loved ones in street style was not easier than doing the same with strangers.I really enjoyed the challenge and I’ll keep practicing it! I really like the “street photography” approach in your family photos! The first is a very nice dutch angle, so that the composition doesn’t result boring and put the shadow of your son in evidence! There is a lot of mystery in it and it could be part of a story! The third one has also a very dinamic composition, with the diagonals and the contrast between blue and yellow.The perpective from where you took the photo were also good to create a more simple background, with less distractions, so that the eye is catched by the subject of the photo. Great job! I really like the "street photography" approach in your family photos! The first is a very nice dutch angle, so that the composition doesn't result boring and put the shadow of your son in evidence! There is a lot of mystery in it and it could be part of a story! Totally agree that capturing loved ones is more difficult than strangers but you’ve done so beautifully. The first one is my favorite…love the angle and shadows. Totally agree that capturing loved ones is more difficult than strangers but you’ve done so beautifully. The first one is my favorite...love the angle and shadows. I like the first photo, shadows and real objekts in play.. This week I was having family vacation and sorry,no much time for comments.But I'll catch up with you very soon.After taking many shots of my son and husband this week,having the assignment in mind,I realized that capturing the loved ones in street style was not easier than doing the same with strangers.I really enjoyed the challenge and I'll keep practicing it! here I have four photos from a project I’m doing on my grandpa. I really love him and I want to preserve his young personality, through my photos. In these photos, in particular, I brought him to take an ice cream, despite he’s 92 years old. I put a photo of him when he was younger, doing faces, close to him eating the ice-cream, just to show that the age doesn’t matter when you are young inside! There is then a photo of him reflected in a mirror, with all the elements of an italian old-style room. Your grandpa series is awesome. Photo contest worthy. All fantastic composition but the first is my favorite for its tone and mood. The use of sepia really brings these home. I truly enjoyed viewing your photo series. Good choice using Black and White. Very engaging and creative compositions, and nice variety of settings. The only thing I dislike, and it’s a minor dislike, is the fan in the foreground. I truly enjoyed viewing your photo series. Good choice using Black and White. Very engaging and creative compositions, and nice variety of settings. The only thing I dislike, and it's a minor dislike, is the fan in the foreground. Such a great idea to work on this project! I love the ice cream set up of your grandpa’s portrait.I see the conceptual contrast -a 92 years old enjoying ice cream and feeling like a child! But to me the photo of his younger years doesn’t add to the story,keeping simpler would be the better. The same thing I see in the photo with the fan.Your grandpa is very well framed,but the big fan in the fore grand is overwhelming and distracting. Keep working on the project and hope to see more from it! I love the ice cream set up of your grandpa's portrait.I see the conceptual contrast -a 92 years old enjoying ice cream and feeling like a child! But to me the photo of his younger years doesn't add to the story,keeping simpler would be the better. here I have four photos from a project I'm doing on my grandpa. I really love him and I want to preserve his young personality, through my photos. In these photos, in particular, I brought him to take an ice cream, despite he's 92 years old. I put a photo of him when he was younger, doing faces, close to him eating the ice-cream, just to show that the age doesn't matter when you are young inside!